Columbus - Shirley Ann Noah Chase, died Saturday, August 4, 2018 at The Forum at Knightsbridge in Columbus in Columbus, Ohio. Shirley leaves her daughter, Cheri L. Brewer; and her sons, Stephen P. Chase, Christopher D. Chase, and Charles T. Chase; and her brother, Charles W. Noah. Born and raised in Chillicothe, Missouri, the daughter of Charles and Ola Noah, Shirley spent her childhood on the family farm. As a young woman, she attended the University of Missouri where she obtained her bachelor’s and master’s degrees. She then earned her doctorate in home economics/vocational education at The Ohio State University. In Missouri, Shirley was home economics supervisor at the University Laboratory School and taught in the public schools. Early in her career, she served as a project associate at the Center for Vocational Education and a supervisor of student teachers at Ohio State. 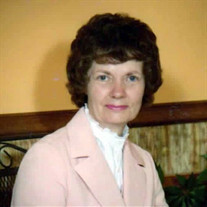 Shirley was Director of Home Economics Career Placement and Assistant to the Director, School of Home Economics, at Ohio State from 1974 to 1978. From 1978 to 1989, she was a research specialist, Information Systems Division, with the National Center for Research in Vocational Education at Ohio State University. She was also coordinator of the Vocational Education Curriculum Material Database for the National Center Clearinghouse. From 1991 until 1998, Shirley served as executive secretary for Phi Upsilon Omicron, The National Honor Society in Family and Consumer Sciences. Shirley remained quite active after retirement. She operated her own small business and was quite active in OSURA – the Ohio state University Retirees’ Association. There she served as vice-chair of the Communications Committee, chair of the Endowment Committee and Member-at-Large to the Executive Board. Throughout the years, she continued to be an active member of Mortar Board, where she briefly worked during the early 90s. Through Phi U, in an effort to share her love of education with others, she created the Shirley Noah Chase Award, a scholarship. Shirley dedicated the award to her parents, who encouraged and supported her in continuing her education. Shirley had a contagious love for the Ohio State Buckeyes. She delighted others with her quirky style and fun wardrobe, often Buckeye themed and scarlet and gray in color. Her home, an enchantment of Buckeye paraphernalia gathered over decades from yard sales and thrift stores, always entertained and amused guests. Shirley was great fun and devoted to her many friends who looked forward each year to her Groundhog Day party. A memorial service in memory of Shirley will be held on Thursday August 9th at 1:00 p.m., at the Worthington Presbyterian Church, 600 High St, Worthington, Ohio. In lieu of flowers, donations may be made to the Shirley Noah Chase Award scholarship fund at Phi Upsilon Omicron Education Foundation, National Honor Society in Family and Consumer Sciences, National Office, P.O. Box 50970, Bowling Green, KY 42102-4270.